Prostaff for HT inc, Eskimo ice fishing, Hardwater-Angler.com, Sullivan tip down! I am married to my wife Laura and have two boys Allen and Hoyt. Favorite method of fishing is modified tight line using small HT tungsten jigs tipped with panfish plastics . Keep moving to stay on top of the fish. I love pan fishing! Crappies and gills are my top targets! I enjoy fishing many bodies of water each winter! I am one of the few fisher people who don't have a favorite lake or fishing spot. I enjoy fishing new water! I rarely fish the same lake more than once or twice a season. While I do enjoy fishing a tournament, I truly enjoy volunteering to take veterans fishing. Each winter I volunteer for a great organization called Veterans Outdoor World. (VOW) a all volunteer organization that is dedicated to getting veterans into the outdoors! My favorite fish to chase has to be bluegills followed closely by crappies! 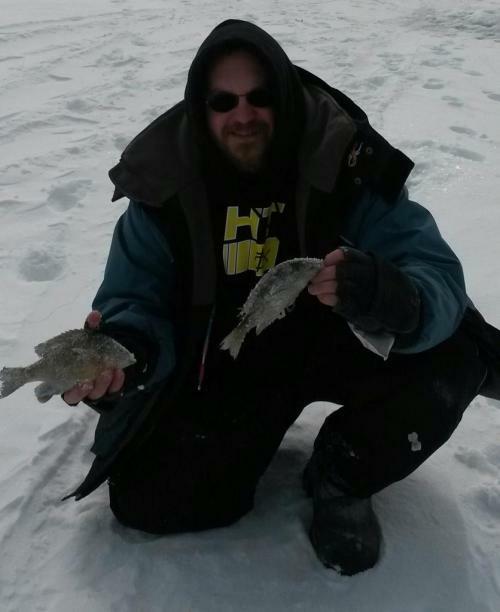 I still try to get out and chase some walleyes and other fish each ice season! © 2019 Polar Fire All Rights Reserved.